Hi all, on March 16 we had a chance to capture the spectrum of the bright comet. Sky coverage was almost overcast at sunset time but luckily, near west horizon, a clear strip allowed us to observe the comet for about ten minutes. Lhires III spectrograph was ready to operate after a set up performed during daylight time with Sun (filtered) and distant terrestrial object. I put vertical slit to include entire false nucleus image stretched by strong atmospheric differential refraction and also to analyze comet tail. Remarkable the strong sodium emission in false nucleus, coma and tail, in relation to a faint C2 Swan bands emission. We do not capture CN at 3880A but I don't know if it depends on very strong extinction in violet range for very low target altitude (and some out of focus for doublet chromatic aberration). There is also a slight absorption immediately to the right (red side) of Na emission in coma-tail transition (appreciable in B profile) that I cannot explain as instrumental defect or reduction artifact (it is visible in the individual raw frames). At the time of capturing, comet was 5.3 degree above the true horizon. To divide correctly observed spectrum for the solar spectrum we should have to observe Moon or a G2V star at similar altitude. Unfortunately clouds did not allow it but I was able to capure spectrum of Moon in a short time it was in clear sky, when positioned at 37 degree above horizon. With these data I tried to calculate division by sun spectra showed in poster with the following method. I hope not to be wrong, in case please let me know. Considering elevation site (1170 meters asl) and Aerosol Optical Depth equal to 0.05, I obtain atmospheric transmission curve for both comet and Moon altitude (thanks to Christian for dedicated web page "Le calcul de la transmission spectrale atmosphérique"). I divide red transmission curve by blu curve obtaining a transmission ratio. Then I multiplied observed Moon spectrum for the ratio curve. 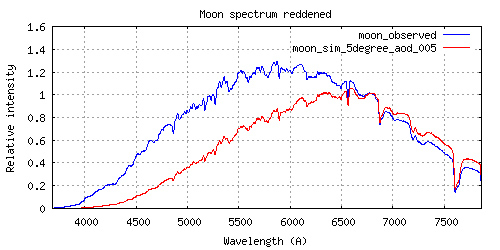 The result should be the "reddened" Moon spectrum, that is the spectrum we observed if the Moon was at the elevation of comet (apart telluric absorption). Finally, the spectrum of the comet has been divided by the last result, obtaining the profile showed in poster. Telluric bands remain because effective depth is quite different at 5 or 37 degree altitude. Really excellent observation Paolo (the very first I see at medium resolution). The Na emission is impressive! It is very close to the sun now and you did remarkably well to take a spectra of it. Christian and Terry, thank you for appreciating my work but especially for inspiring entire spectroscopic team with a plenty of activity and valuable information! The presence of such extensive Na lines is a real surprise. This observation may be of great scientific importance. I was contacted by Professor Koutchmy about it. Is it possible to send the raw image to a ftp (or what size will represent in zip archive) for further analysis ? Christian, I look for a server where I could load all files. If you have please tell me. I have 25 bias, 21 dark and 20 flat frames. If ok, I prepare the relative master, adding 7 comet light frames, moon, neon and low consumption lamps (osram dulux that I use for wavelenght calibration). Unfortunately some clouds reduced effective integration, furthermore away from the nucleus the SNR is lower. But a short strip (and close weak absorption to red side) is visible. I noticed in your original spectrum image that there is some Na emission in the spectrum in the region below the comet (from the extended coma?) How did you subtract the sky background? Did you take a separate sky spectrum or did you use this region below the comet? The reverse P cygni shape of the Na line is interesting. Could the Na absorption line be from the sky background (at radial 0 velocity) and the emission line be blue shifted, accelerated by the solar wind which will have a strong component in our direction currently?